I talk to a lot of people who say they want to write a book. Then years later, when I talk to those same people, I discover that few of them have finished the book that’s been on their hearts. Some people think writing a book is just about the writing. But there’s a lot that goes into writing long before the first word is etched on paper. This is the Prewriting Stage, and it’s uncomfortable because it feels like you’re walking through fog. You have an idea—a concept—but it’s hazy or incomplete. Experienced writers know to linger here, letting the idea gestate and take shape. This is the time to research your idea, to see what other books have already been written on it, and to formulate how you will present your idea with a unique angle. Some writers might want a complete outline to emerge before writing, while other writers might forge ahead with a general idea of where they’re headed, knowing they’ll need a few “return trips” to this brainstorming/researching phase as they go. And it’s all okay. Writing is a recursive process that involves discovery along the way. The writing journey will always involve some degree of fog. The exciting part is when the fog lifts and your fingers race across the keys to take you as far as your vision can carry you. But when the fog returns, experienced writers know not to give up. When you put in the work—doing the necessary research and then braving to write some unlovely words in an early draft—I’ve learned the fog becomes less scary over time. Most people assume this is where books are made. But this is actually the shortest stage of them all. I wrote the bulk of Deeper Waters in five months. But the book as a whole was a full year in the making. Lots of books are written about this stage alone—how to write words and construct sentences for a manuscript. 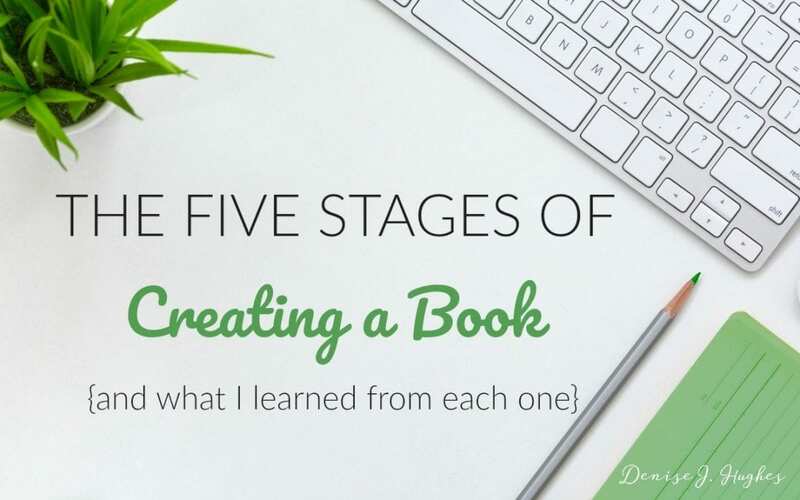 I have lots to say about this part of the process, too, which I’ll share in future posts, but one thing I learned during this stage is the importance of being intentionally selective about the words I read and the voices I listened to while writing my own book. I spent months in research, but when it came time to sit at my computer and write a manuscript, I refrained from scrolling through social media feeds—for several months. I didn’t read blogs or news articles online. I didn’t even read the new books that were released during that time. I set them on a shelf and saved them for when I was done writing my book. As I writer, I believe that what we take in, is what will come out. So I read the Bible every morning, then I devoted my time to writing. I did choose one author—a pastor—to read during this time. Because I wanted a pastor speaking into my life spiritually while I wrote a book. Every night I read a couple chapters by this pastor. By the time I finished writing Deeper Waters, I had read seven books by this pastor. I’ve never met this pastor personally, but I believe God used him to shepherd me through this season of intense writing. Writing the last word of the last chapter is momentous. But it’s not the end. It’s really just the beginning of another process. An editor will soon send you feedback, and it’s important to listen to everything he or she has to say. In my first completed manuscript of Deeper Waters, I wrote a chapter I really loved. My husband even said it was his favorite chapter. Then my editor said it was great, but it didn’t really fit with the other chapters. And you know what? She was right. So I took it out. The whole chapter. I still love it, though, and it may become the seed of a new project. It just wasn’t right for this project. Here’s the thing…you never throw away your writing. You always want to keep the “leftovers” in a safe file somewhere. Because you never know. It could become just the thing you need at a later point in time. Editing, of course, is a key part of the process. But this stage also becomes the point where you try to bullet proof your manuscript, not to mention your heart. Yes, it’s wise to anticipate possible criticism and then strengthen those areas in your book as necessary. But that’s not what I’m talking about. Bullet-proofing takes editing to another level, whereby you try to make your manuscript so perfect it couldn’t possibly be criticized in any way. But the truth is, it’s not possible for any book to be entirely bullet proof. Because no book is meant for everybody—except the Bible. And yet, a perfectionist can easily get stuck in this stage, endlessly editing, all in an effort to make it “perfect.” While I was in this stage, I had to accept that absolute perfection was never my goal. Being an author means inviting others into your inner sanctum—that place where your heart is most raw and the real you, with all its foibles, is open to be read. If an author tries to offer a book to the world while wearing a bullet proof jacket, there won’t be anything there for readers to connect with. Readers want to connect with the humanity of the author—flaws and all—not an impenetrable bullet proof version of a person. Real writing means imperfection. Now I don’t mean authors should be okay with sloppy work. Not at all. Authors must learn to live in the tension of exercising excellence in craft while also realness of soul. When you turn in the final edited version of your manuscript, and you know it’s going to the printers, that’s when you have to lay down the bullet proof jacket you so desperately want to wear. You have to accept that it is what it is, and it is what it is meant to be. This is probably the hardest stage of all. You’ve spent the better part of a year working on this book in almost total isolation. But your manuscript is now in the hands of printers. You won’t see it again until it arrives in a box on your doorstep, in actual book form. So it’s a strange kind of waiting. When an author is in book-purgatory, it can be unsettling because you’ve gotten used to being under a pressing deadline. With more time on your hands, you almost feel a little lost now that the deadline is met. So this time of book-purgatory becomes a little reprieve, except now you have to catch up on everything else in your life that had to wait while you wrote a book. Then you must start planning how you’re going to share your book with the world. As you plan for the book’s release, it begins to feel more real. Until now, it’s been a huge part of your private world, but it’s about to go public. You may wonder how it will be received. But at this point there’s only one thing you can do: Lay it on the altar. Again and again. This is a good time to remember that writing is never about you. Even when you’re telling your story, it’s still not about you. It’s about God and His work in your life. And it’s about the reader and the desired outcomes your book offers them. And then…it’s finally time…to welcome others into this world you’ve been living in for the past year. This stage can be full of mixed emotions because you have to move from that very private, secluded space in your heart to a very open, public space. And, of course, you know you can’t do it alone. So this becomes the most exciting—and most terrifying—of all the stages. It’s exciting because you really believe in the message of your book and you want it to be life-giving to others. It’s also terrifying because you know you can’t really control how it’s received. So you make a lot of return trips to the altar. Sometimes daily. Sometimes hourly. The best part about releasing a book into the world isn’t seeing your name on a cover; it’s hearing stories from readers—stories about the parts of your book that resonated with them most. Above all, there’s a peace. Because you finished the work God called you to do. And while there’s still a lot of work to be done—in sharing with others and welcoming others in—there’s a steadfastness of soul that comes from knowing you’ve been obedient to do what God asked you to do. And you know you’d do it all over again. This weekend the UPS guy placed some boxes on my doorstep. And they’re for launch team members! I want them to have an actual book, not a PDF or electronic version. you can FILL OUT THIS FORM HERE. 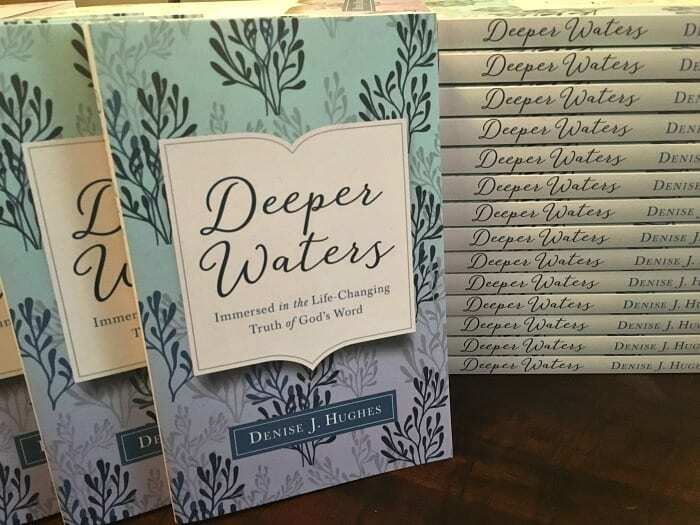 You can learn more about Deeper Waters HERE.